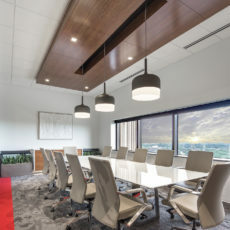 Up to date and up to the task: Merging style with function JLL, a global real estate firm, focuses on creating “amazing spaces where people can achieve their ambitions.” Their Indianapolis location was in need of a renovation to fully embody that philosophy. JLL viewed the project as an opportunity to create an inviting environment that projected its culture and enhanced recruitment. The phased process involved overhauling JLL’s space and renovating an adjacent suite. “JLL’s people engage with each other well, so their workplace needed to support those interactions,” said Camille Inchauste, OfficeWorks’ account executive. The project started with a foundation of effective communication. To increase the variety of spaces in the office, JLL knew they had to reduce the size of the workstations. “Camille helped us select pieces with the functionality of larger cubicles, so the square footage became irrelevant,” Adam said. OfficeWorks also created a mock-up to help JLL test drive the workstations and make any needed adjustments. That focus on customization extended to OfficeWorks’ installation team. “They were awesome, from the delivery time to some fine-tuning after we’d been in the space for a while,” said Adam. JLL’s office increases options for meeting and working, from sit-to-stand workstations and private phone rooms to flexible conference spaces. Adam’s favorite pieces are the high-top tables in the strategy rooms. “It’s a functional space, and the guitar-pick-shaped tables add interest,” he said. 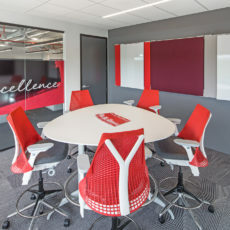 The resulting office considers both aesthetics and operations, creating an effective environment for employees and a positive first impression for visitors.